World renowned relationship experts Drs. 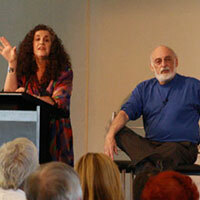 John and Julie Gottman were in Adelaide in February 2012 presenting their two day workshop ‘Bridging the Couples Chasm’ Couples Therapy – A Research-Based Approach. This inspiring workshop provided insight into couples’ struggles using research-based assessments and effective interventions. Combining lecture, video from Dr. John Gottman’s research with couples, and film clips from the Gottmans’ clinical practice. “I felt quite honoured to have the opportunity to hear first handout about their practice the theory that underpins it, the implementation of the outworking of that in the sessions via DVD footage. Thank you to the Gottman’s and their team, Iain Henderson from the Australian Institute of Social Relations and Kassan Events for all contributing to a successful conference.